Since our incorporation in 1933, we have been given the task of providing the residents of our Fire Protection District with as adequate and timely response as possible to their fire or medical emergency. Our role has expanded drastically since those early days as we now respond to over 1,100 total alarms of Fire and EMS annually. Additionally, we rank as the busiest mutual aid company in the township due primarily to our central location between the communities of Armor, Big Tree, Lake Shore, and the Village of Hamburg. In addition to responding to alarms of fire or first aid, we are also dispatched throughout the town to provide mutual aid assistance and support during natural disasters, major catastrophes, or police-related emergencies. We also dedicate a considerable amount of time to fire prevention education, ongoing fire and first aid training and a variety of community support functions. Members of this company are trained and New York State certified in firefighting tactics, and have grown into one of the highest rated firefighting task forces in the state. Our first aid squad consists entirely of certified, registered New York State Emergency Medical Technicians, plus an additional squad of Advanced Emergency Medical Technicians capable of providing life support functions such as intravenous fluid therapy to patients requiring such immediate medical attention. In all, the training and equipment used by these squads has helped them grow into this sophisticated task force, dedicated to continued service to the Scranton Fire Protection District. A special goal of this company is continue to provide modern fire service without raising taxes. The members regularly hold fund raising activities to support their goals, and lessen the burden of members of the community. 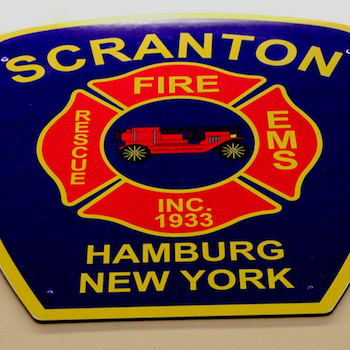 The service provided by the Scranton Volunteer Fire Company has been rated as among the best in New York State, paid or volunteer. This high rating results in direct saving to residents in this community through lower insurance rates, to go along with the lower taxes. This high rating is possible only through the constant efforts of the members of the Scranton Volunteer Fire Company. To continue with this goal, the members need the help of resident who are willing to share the responsibility of protecting this community. Contact us for information. The Scranton Volunteer Fire Company is here to help anytime, day or night, for any fire or first aid emergency by calling 716-648-4563.